Navarcantieri began to build pleasure craft in 1975. Since then, thanks to accolades from both boating fans and the press, the shipyard has expanded continually to keep pace with growing demand and has specialised in the production of boats for demanding owners, especially with respect to the boats' seaworthiness. The yachts built by Navarcantieri are known for the particular attention that the designers and shipyard personnel pay to all of the details that ensure boating safety. This means that the boat structures are strong and that the waterlines guarantee very high performances. These are the guidelines for all Navarcantieri projects, starting with the first boat built for a new line. Since it was founded, the shipyard has produced yachts made of wood, drawing on the skills of master carpenters and cabinet makers able to transform fine wood into elegant deco furniture elements. Navarcantieri has also produced numerous yachts with fibreglass hulls, but the P 80 we feature in this issue is the product of the shipyard's decades of experience in building boats of wood. It is a 24-m yacht with two decks plus a fly deck, with ample and comfortable space for eight passengers and a crew of two. The interior consists of a full-sized owner's cabin astern, two guest cabins with twin beds amidships and a double cabin forward, all equipped with private bathrooms with all the accessories necessary during a cruise. There are two single cabins in the prow for the crew, with a shared bathroom and independent access. 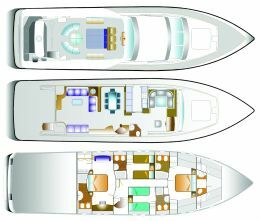 On the main deck, the spacious cockpit leads to the saloon, which occupies the entire breadth of the deckhouse and is outfitted with two fore-and-aft sofas and a smaller sofa abeam. This area is very well lit with natural light, thanks to the large windows in the superstructure, which also provide light for the dining area forward of the saloon and for the galley, located forward, to port. To starboard, opposite the galley, there is a bathroom, easily accessed during the daytime without the necessity of going into the sleeping area. The control station is also located on this deck, foremost to starboard, as is a relaxation area with a U-shaped sofa and table (to starboard). On the fly deck, which extends towards the stern and almost completely covers the cockpit, the tender is stowed beneath the high roll bar while, further forward, we find the open-air dining area, with circular table and comfortable chairs. There is a central, spacious sundeck with small sofas fore-and-aft and, in the prow area, the control station, also centrally located and equipped with three chairs and all of the steering controls. Aesthetically, Navarcantierìs P 80 is very elegant, with clean, sharp lines, and the interior is very elegant throughout. And, of course, the future owner and the shipyard's personnel can work together to choose the interior decor. For further information, please contact: Navarcantieri; Via della Scafa 113; 00054 Fiumicino (RM); tel. : +39 06 65024236; fax: +39 06 65024210; e-mail: navarcantieri@libero.it.